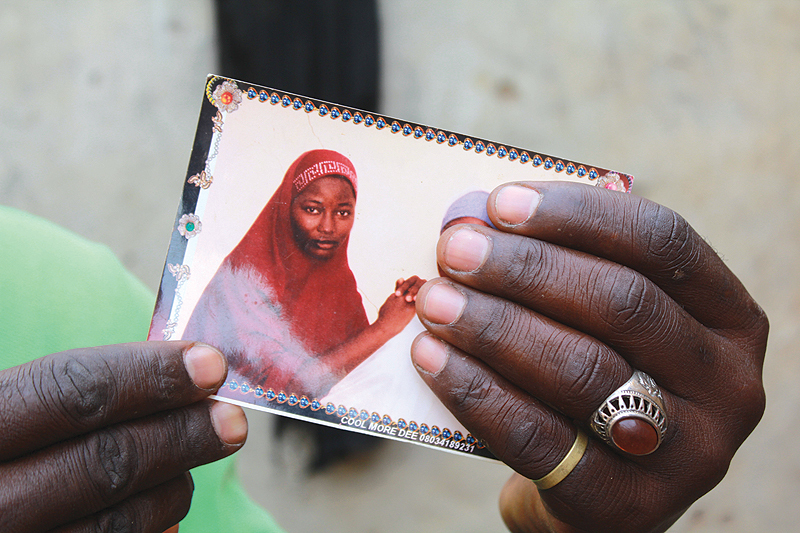 ABUJA: Five years after being kidnapped by Boko Haram, freed Chibok girls have nightmares about their 100 missing classmates and are burdened by guilt for surviving, while shielding parents of dead friends from the truth about their daughters’ fate. The mass abduction of 276 schoolgirls on April 14, 2014, from their school in northeastern Nigeria – the biggest publicity coup of Boko Haram’s jihadist insurgency – sparked an global outcry and the #BringBackOurGirls social media campaign. On the fifth anniversary of the kidnapping, which the Thomson Reuters Foundation exclusively revealed was the accidental outcome of a botched robbery, many former captives are still haunted by a tragedy the world has largely forgotten. “Sometimes, it can make me sleepless because I’m thinking of them. Sometimes, they are even appearing in my dreams. It is very painful,” Margret Yama said in a phone interview from Yola, in northeastern Nigeria. The 22-year-old is among the 107 Chibok girls who were found or rescued by the Nigerian military, or freed in negotiations between the government and Boko Haram. President Muhammadu Buhari made crushing Boko Haram a pillar of his 2015 election campaign and he has vowed to spare no effort in ensuring all abducted Nigerians are freed. But his administration has failed to defeat the decade-long insurgency, who have been waging attacks since 2009, with an uptick in attacks on military bases and strategic towns ahead of February elections, in which Buhari secured a second term. “Efforts are being intensified to secure the release of all hostages, not just the Chibok girls,” said presidential spokesman Garba Shehu. “The operations are ongoing and the aim is for comprehensive engagement and settlement,” he said, adding that a split within Boko Haram – with the breakaway of the Islamic State in West Africa faction in 2016 – has affected government efforts. Yama is one of scores of young women that the government sent in 2017 to a special remedial course at the American University of Nigeria (AUN) in Yola. Although she received months of counseling and medical care after her ordeal, she feels sad when she remembers her friends still stuck in Boko Haram’s Sambisa Forest hideout, where many died from snake bites, childbirth and sickness. “I am thinking, how are they feeling now? More especially when it is raining season, I am thinking of them because no shelter, no room, without even a mat to sleep on, talk less of a bed,” Yama said. “Also this aeroplane that used to go to Sambisa and drop bombs and kill people, so I am thinking of them, too,” she said, recalling Nigerian military air raids on the forest. Some of the Chibok girls refused to go home when approached by mediators during a second group release in 2017, fuelling fears that they had been radicalized, or felt afraid, ashamed or even too powerful to return to their old lives. Relatives of missing girls often ask those who have returned home about their daughters. “We didn’t tell their families about the ones that died. But they are always asking us and we tell them that they are fine,” said 22-year-old Hannatu Stephens, also a student at the AUN. “We don’t know how to tell them they are dead.” Stephens lost a leg and some close friends who were sitting and chatting when a military plane attacked the hideout. “Yesterday, I am thinking about (one of her friends) … I cried about that girl, about her, and I am thinking about her mother,” said Stephens, in a voice quivering with emotion. Although the government provided Stephens with a prosthetic limb, she said the pain in her leg sometimes prevents her from sleeping at night or focusing on her studies. For 21-year-old Kauna Bitrus, who is in her second semester at a community college in the United States, sadness sometimes strikes while she sits in class. She fantasises that her missing classmates could attend lessons with her. Bitrus was among 57 girls who escaped by jumping off the trucks ferrying them away from their Chibok school. She vividly remembers holding her friend’s hand as they decided to jump, then spending the night running and hiding in the forest. “We decided that it was better to die in the forest (than go with Boko Haram),” said Bitrus, who was taken to the United States by a charity and lives with a host family.